From the author that gave you the Sunday Times top 10 selling title, Fairytale of New York, join our heroine Romilly as she discovers how far she will go to find the man of her dreams. What would you do to find the one that got away? As the singer in a wedding band, Romily Parker has seen her fair share of happy endings, even though her own love life isn’t quite as simple. On the last Saturday before Christmas, (shortly after disastrously declaring her love for best friend Charlie), Romily has a brief encounter with a handsome stranger whose heart-stopping kiss changes everything. Determined to find him again, Romily embarks on a yearlong quest, helped (and sometimes hindered) by enthusiastic Uncle Dudley, cake-making Auntie Mags and flamboyant Wren. Will she find the man of her dreams? Or could true love be closer than she thinks? The ONLY book that you’ll want to curl up with this winter — perfect for fans of Jill Mansell and Sophie Kinsella. I really enjoyed reading this book. I fell in love with all the characters, apart from the few who mocked and didn’t support Romily in her quest such as her parents who didn’t see the point in trying to find this guy. As you can see from the synopsis, Romily has a brief moment with a guy before christmas, after professing her love for her friend who turned her down, but this guy is called away before anything can happen – she didnt even get his name! So she’s made it her mission to spend a year looking for him and if she hasn’t, then at least she tried. The wedding band she is in with her friends, are all supportive with this quest, doing whatever they can to help her along the way, including the guy – Charlie, who she professed her love to, although he wasn’t happy about it. It about having that brief moment’s kiss a stranger who turns your world upside down. Makes you feel things. But then he has to run off before you get his name, or learn anything about him. But he’s all you can think about because you knew, in that moment; you both felt the same way, despite it only being a kiss. 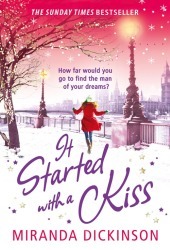 I loved the journey and focus that Romilly had for trying to find her knight in shining armour and the guy who blew her away with just one kiss. She gives herself a year to find him and if she doesn’t find him, she’ll get over her quest and get on with her life. She has support all over the place, from her friends, to her aunt and uncle, even a massive follow on her blog for her search of him. I loved how much determination she had because the guy changed up her feelings. It’s such a perfect and beautiful fairytale of a book and when i think about it, it makes me smile how she finally ended up with the guy who felt exactly the same way as she did. She yes, this is the book that makes me happy and makes me think that (although its fiction) if that happened to me, that I’d have the support and determination Romilly had to find her perfect guy despite not knowing a single thing about him, but wanting to find out who he was and if he felt the sparks she did too. I did have a few different endings in my head but none of them were the correct ending which I’m quite glad as I guess all the time and most are right. I loved how charlie decided he had feelings for her, which was kind of inevitable as that what guys are like but I’m glad it ended how it did between then and she finally got the guy who had been feeling the same way (I’m not telling you which one). Definitely give this book a go! !